We are on a Buddhist pilgrimage in India, traveling by bus on the road from Varanasi (Benares) to Sarnath. The roads in Bihar Province have to be experienced to be believed. The terrain is flat, but you would never know it from the bone-rattling rides that we have been getting. The roads are like washer boards. Most of us abandon the idea of reading; it is as if the book is mounted on a paint-mixing machine. At one point I ask if a new pair of kidneys is included in the price of the trip. Fortunately, the Indian countryside is a source of never-ending fascination. The fields are lush and green. Mustard plants with their delicate yellow flowers stretch to the endless horizon. All manner of vehicles crowd the road: pony carts, bicycles, jeeps, motorcycles, three-wheeled mini-vans, white Ambassador sedans – descendents of a long-deceased MG – bicycle rickshaws, pedestrians, brightly-painted trucks, and other buses. 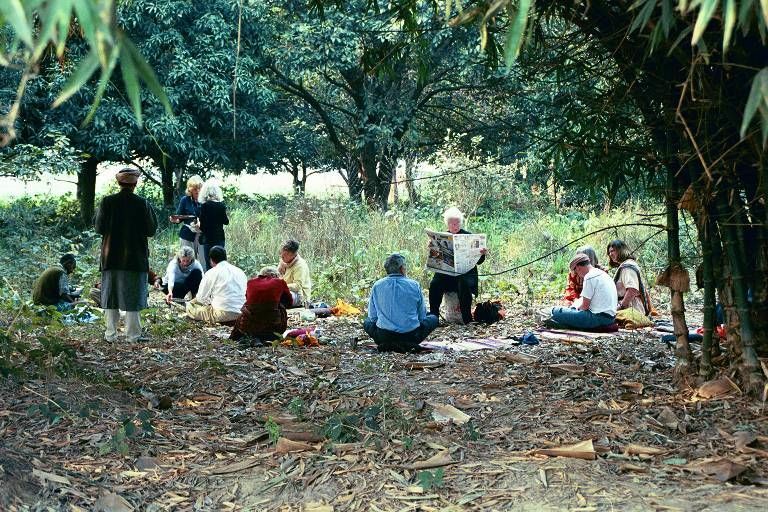 Groves of trees dot the landscape, and provide places for roadside lunch stops. At regular intervals we see tiny Indian villages with brick and mud walled houses and thatched roofs. People are busy everywhere, working in the fields, tending the open-air shops, threshing rice, cooking, bathing at water pumps, herding water buffalo, and going about the business of life. Everything in India, good or bad, is in your face. It is life at its most vibrant. I am busy being mesmerized by the countryside when my dull contemplation is interrupted by a loud crack, like a medium sized explosion. That is quickly followed by a slightly smaller bang. My camera and bags leap into the air. I snag them mid-leap, but don’t have time to appreciate the quick response. After a fashion the bus comes to a halt. I assume that we have blown a tire. Fortunately the injuries are minor and few, keeping in mind that “minor” is defined as something that happens to someone else. I look around for something constructive to do. The injured people are being cared for, so I start to clean up some broken glass. Perry, one of my fellow pilgrims, gets a little upset about that. He is concerned that I will cut myself. I assure him that this is safety glass, and I show him that it is not sharp, but he is unconvinced. Out of respect for Perry’s state of mind, I stop picking it up. Once things have settled down a little bit, I go outside. I am startled to see that the entire rear axle is missing. The bus is bowed down in a rearward prostration. There is a slight buckle in the body of the bus about 2/3 of the way back from the front of the bus. We have driven about an hour outside of Varanasi. It is clear that we are going to be here a while, so I take out my mat, my cushion and my book, and settle down on the side of the road. I cannot be of any help, so I may as well stay out of the way. At least the book has stopped vibrating. After a short time, our charming helper on the bus brings me a cup of Chai. 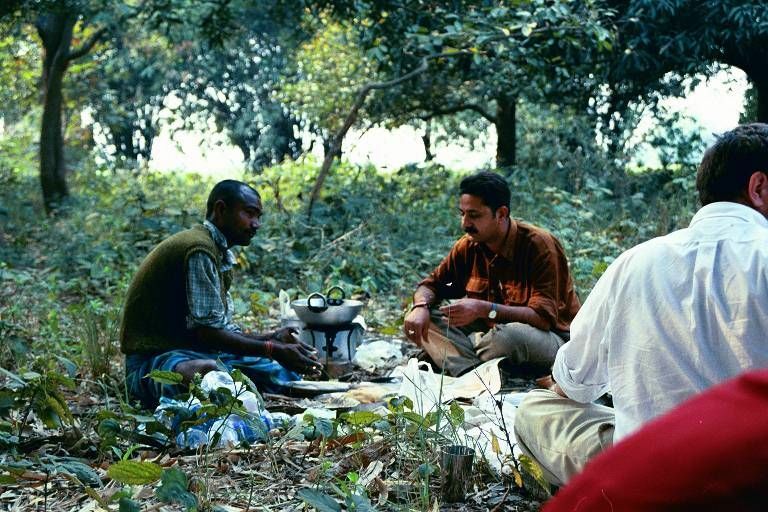 As he hands it to me he says warmly, “Some tea for my friend.” I have long ago learned that the people in India can be so disarmingly charming that it makes no sense to try and give back to them as much as they always seem to be able to give you. A little while later he graciously brings me a banana. Where else can you get care and attention like this? Meanwhile, the rear axle, it turns out, has landed more or less in tact on the other side of the road, about 75 feet behind the bus. One of the tires is shredded. Whatever was holding it on to the bus – it had to be either welded or clamped on – has given way, and it and the bus have parted ways. Good fortune has prevented the bouncing rear axle assembly from hurting anyone. There is a school across the road, and I am grateful that no one is seriously injured. From my modest experience in auto mechanics, I guess that this bus is at least 2 weeks away from any useful service. If the frame is bent, it may be a complete loss. Many years ago I had a Volkswagen that broke a rocker arm in Maine. It took a week to get the parts and fix it. This is a relatively simple repair. I can only imagine what must happen to get parts and fix a broken bus in the middle of the poorest province in India. I look around me and think that this might be a good place to start a monastery. At the same time our helper Jagdish is out doing his magic. You just cannot believe how things happen in India. When something needs to happen, it does. Jagdish goes down the road and finds a guy with a small propane stove and a wok. They also scrounge up some vegetables, and some dough for chapattis, the Indian national bread. Some of the people in our group begin chopping vegetables and making lunch. I’m convinced that there must be a space warp in India so that every time that you need something, the warp opens up and whoever you need just pops through. Our little group has created quite a stir. Shantum once told us that a bunch of American tourists in India is better than television. We have settled down into one of those roadside groves. Lunch is being prepared, and the rest of us are reading, talking, or just enjoy the typically perfect Indian weather. A crowd begins to gather. At some point a large group of policemen shows up to protect us. The police in India are very intimidating. They dress in combat gear and carry semi-automatic rifles. There are still bandits (bandits?!) in this part of India, and they have been known to stop buses and shake down the tourists. A good tour guide like Santum makes sure that the local police chief gets some financial encouragement for protection. It’s included in the price of the tour. The crowd continues to grow and finally a band (a band?!) shows up. They are dressed in red uniforms that look like they are left over from the British colonial era. At this point the police have had enough and start to disperse the crowd, although what they end up doing is simply “crowd reduction”. Once the crowd gets down to a certain size, they slacken their efforts. Apparently there is a maximum allowable crowd size when American tourists are stranded by the side of the road. Some time later several cars show up and a bunch of men pile out. It is hard to tell who is who, but one of them is the chief mechanic from the bus company. In India it is always hard to tell who – if anyone – is in charge. I suspect that Indians grow up in such close quarters that they learn to communicate with a minimum of words. There is very little discussion among the group. They go across the road to the orphaned rear axle. I don’t see any tools anywhere. Several of the men find pieces of wood along the side of the road and use them as levers to begin moving the axle. I lose interest. I assume that their efforts are futile. I’m not really sure what they think they will accomplish. After a while I look up and see that the axle is now on the road, just behind the bus. 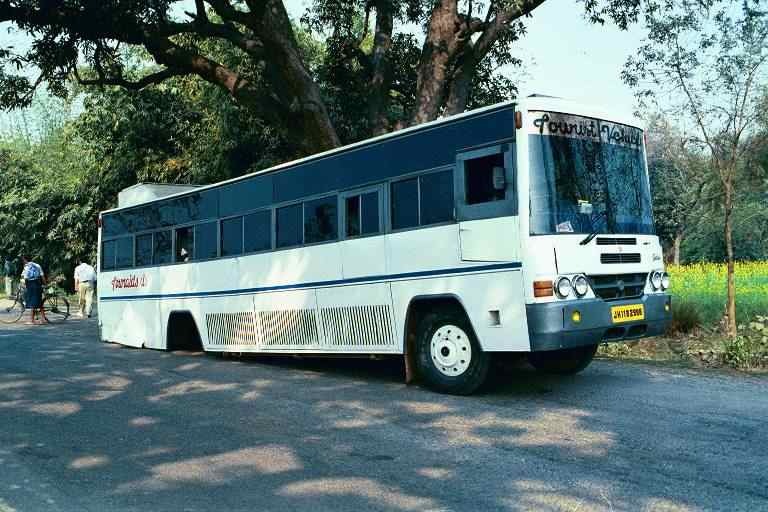 The back of the bus has been jacked up and placed onto jack stands that are supported by several layers of bricks that have been scavenged from the side of the road. It is the kind of thing that I might have done when I was in college and fought the constant battle to keep my ageing VW on the road. I am slightly puzzled and amused by what I am seeing. They cannot possibly be thinking about re-attaching the rear axle. First of all, the differential – the joint between the two wheels – is leaking oil. This will have to be fixed. Second, whatever held the axle onto the bus has to be fixed. If that is a weld, they will need a welding machine. No matter what, they will need some parts. You can’t fix something with nothing. Then there is the matter of the shredded tire. I think of my VW in Maine, remember that I am more or less in the middle of nowhere in India, and know that this will never happen. 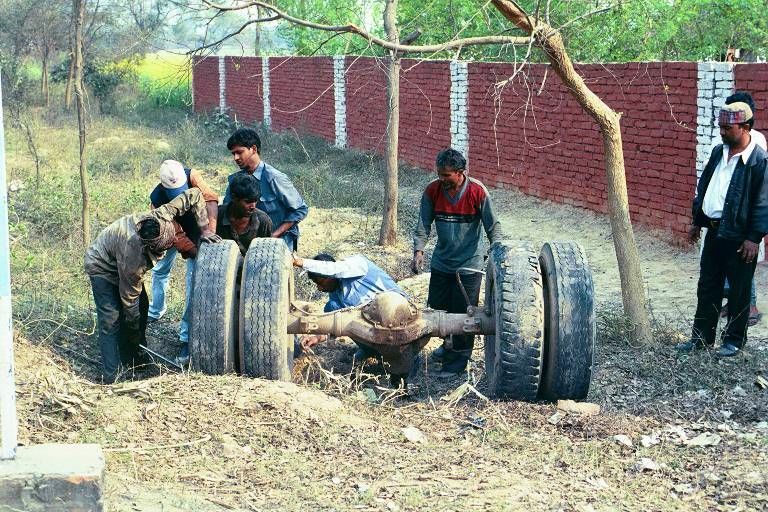 The Indian mechanics seem – nonetheless – determined to carry out the charade. They move the rear axle assembly into position under the bus. I notice that the differential is no longer leaking. Next to me on the road a can of oil for the differential has magically appeared. I don’t understand how this has happened. No delivery has been made. I still don’t see any tools. Perry laughs that all they have is a screwdriver and a wrench. I’m not sure if he is kidding, but I don’t see any tools anywhere. Just as the rear axle is properly positioned, an Ambassador drives up and a man pops out. He is carrying 4 u-shaped bolts about as long as your forearm. Parts have arrived. Now I see the old broken and twisted u-bolts on the road. They are the culprits in our mishap. I do a double take and see that the shredded tire has been replaced. I’m not sure how that managed to happen. I smile a little to myself. I can’t believe what I am seeing. I’m still not sure if I will get back on the bus again, but I have a new and deep appreciation for the mechanical miracle that I am witnessing. Other people in my group remain insistent that they will not get on the bus again. I’m not so sure. 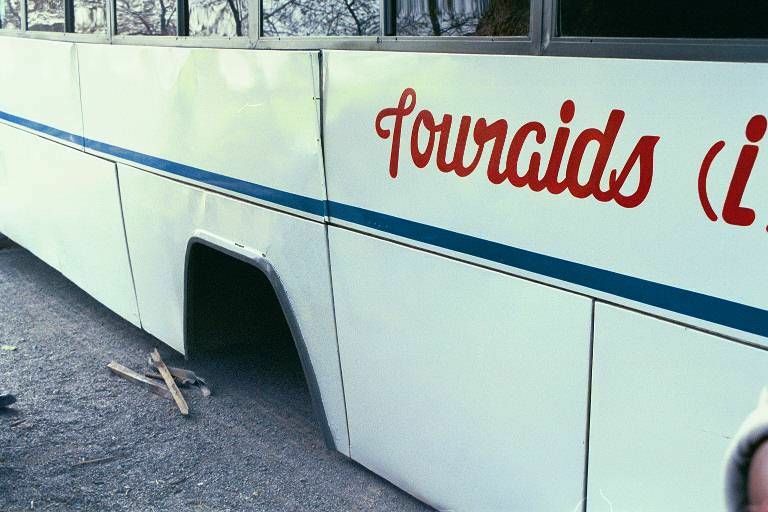 If the frame isn’t bent – the one remaining concern – the bus may be – gulp! – eminently road-worthy. I finally see an adjustable wrench as the chief mechanic attaches the u-bolts. In the U.S. a mechanic wouldn’t tackle a job like this without a garage with a lift and $10,000 worth of Snap-On tools. I haven’t heard seven words uttered by the mechanics in the 4 hours that they have been here. Like so many things in India, I am witnessing a dance that is a magical piece of choreography. If I had not been watching it for myself, I would not have believed it. I did see it, and I still do not completely believe it. A van and a couple of Ambassadors arrive to take us on our journey, so I don’t get to see the final chapter in the bus fixing saga. I would have liked to know if the frame was OK, out of professional curiosity. However, bent frame or not, I know that I have witnessed a miracle, the kind of thing that seems to happen routinely in India. Fortunately I know that it’s not real… it’s only a dream. This entry was posted in Buddhist history, India and tagged Buddhist pilgrimage, Buddhist travel. Bookmark the permalink.